Let me ask you this, are you are the kind of person who doesn’t mind working? Are you looking for a way to improve your financial security? Well then I have something for you. You know, I’m not much different than you. I’ve worked hard all my life, I’ve had a couple good opportunities, I guess, but nothing ever panned out. I’m just a regular working stiff. When I started LensDoctor in 2002, it was for my own personal needs. I was at one of those crossroads in life and was forced to make a change. I finally had to “Go For It” and when I did, something happened. I can’t explain it but things started falling into place. I’m not really a religious person but I have to say, this was divine intervention. Free, free, free... So what's the catch? Well, I hope to sell you all your supplies, silly. Look, I've done headlights exclusively since 2002 and the opportunities are everywhere, repair shops, body shops, used car dealers... on and on. But you've got to know what you are doing. The quick fix artists have made their rounds more than once and failed. 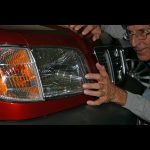 Just look around you, 1 out of 3 cars' headlights are at some level of decrepitude and with all of the DIY remedies out there, the problem keeps getting worse.